The wonderful thing about photography is that sometimes you don’t need to go too far from home to capture a shot. On Sunday (5th April) the sky in Llanelli was looking perfect for a beautiful sunset so we jumped into the car with the intention of heading to Burry Port. However as we passed Sandy Water Park – which is just a few minutes down the road – it looked an ideal place to stop to capture the evening’s sky and sunset. Sandy Water Park is a park in Llanelli with a decent sized pond/lake which is inhabited by a bunch of swans, ducks and gulls. It’s actually a good place to practice wildlife photography! Now I’ve taken a shot of Sandy Water Park Swans when the Eisteddfod was in town but when the image was critiqued in a camera club competition it was suggested that the image could have been stronger if the swans on the left were looking towards me! 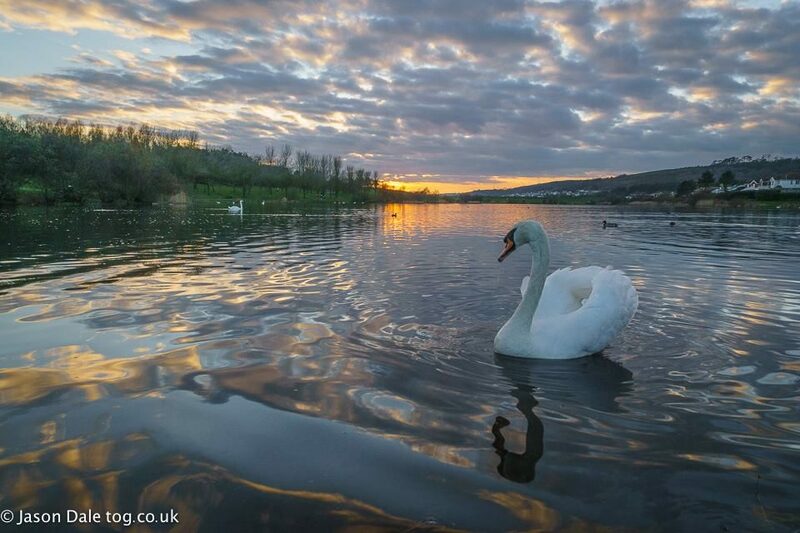 So the aim for Sunday’s shot was for a nice sunset that included a swan looking in the right direction. Sometimes with photography you set up and you don’t get the shot you want but on Sunday the image featured was taken within a few minutes – a stroke of luck given that the swan stopped exactly where I wanted it to. The swan was only about 2/3 metres from me but was happy to ‘model’ as it thought it was getting fed and the birds in the park are used to people. A good tip though – if you are photographing swans keep a safe distance and try and have someone with you watching them. As soon as I had this shot I had a good feeling about it – there’s a lovely reflection in the water from the sky, but you also have reflections of the trees and swan too. The swan is on the third with enough head tilt and feather ruffle to make it more interesting. There’s also the sunset and even the birds in the distance to add in the mix. I’m pretty happy with it anyway! This was shot using a Sony A77ii with 16-50mm f2.8 lens – 16mm, 100ISO and 1/60 second. I was asked on Facebook if this is a HDR shot – the answer to that is no. I shoot in RAW and tweak things like levels, shadows and colours in Lightroom. I entered this one into this week’s #WexMondays competition.